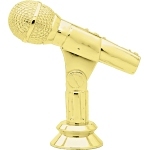 A great speaking trophy or award for the Worst Speech, Best Speech, Longest Speech, Most Boring Speech, Inspirational Speech or even for karaoke or singing competitions. Made of spun nylon, with a gold finish, the trophy figure stands 4" tall, not including base. Price includes base and free personalization on a laser engraved plate, or for an additional $5.00, select an engraved brass plate.